Ramachandra Kaviraj visited Vrindavan where he associated with Jiva Gosvāmī and the other Vaiṣṇavas, receiving their blessings. They were very pleased to hear his poetry, so much so that Jiva Gosvāmī gave him the Kaviraj title. He was thus one of the eight Kavirajs (asta-kaviraja). He was Narottam Ṭhākura’s favored companion for preaching activities and spiritual association. Ramachandra, a great devotee with an attractive figure, was born in the town of Sarajani on the banks of the Ganges as the son of Sunanda and Chiranjiva Sen, a well-known minister of the king of Gauḍa, a devotee of the Brahmins and Viṣṇu. Ramachandra was not in any way different from Narottam Das Ṭhākura, the king amongst the poets. Ciranjiva Sen was a resident of Srikhanda, whose wife’s name was Sunanda. They had two virtuous sons, the elder was Ramachandra, the younger Govinda. Ramachandra was a disciple of Srinivas Acharya who took the title Kaviraj. His siddha name was Karuṇa Manjari. Ramachandra Kaviraj was born in Vaidya family. After the death of his father, he went to live in Kumar Nagar with his maternal grandfather, Damodar Kaviraj, who was a disciple of Narahari Sarkar. Later he went to live with his younger brother Govinda Kaviraj in the village of Telia Budhari in Murshidabad district. This place has the distinction of being his Sripat. Śrīla Bhakti Siddhānta Sarasvatī Gosvāmī Ṭhākura, however, mentioned that Ramachandra Kaviraj’s Sripat is in Kumar Nagar. Srinivas Acharya was overcome with affection for Ramachandra that he gave him the diksha mantra and engaged him as his personal servant. He had unparalleled devotion to his guru and would follow his guru’s words without any kind of reservation. 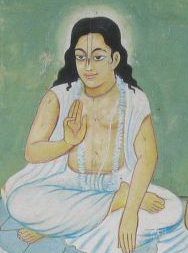 Though Bir Hambir became Srinivas Acharya’s disciple, Ramachandra Kaviraj acted as his siksha-guru. Ramachandra Kaviraj also visited Vrindavan where he associated with Jiva Gosvāmī and the other Vaiṣṇavas, receiving their blessings. They were very pleased to hear his poetry, so much so that Jiva Gosvāmī gave him the Kaviraj title. He was thus one of the eight Kavirajs (asta-kaviraja). He was Narottam Ṭhākura’s favored companion for preaching activities and spiritual association. Paramananda Bhattacharya, an ocean of love, Jiva Gosvāmī and the other residents of Vraja, listened to Ramachandra recite his own poetic compositions and they joyfully awarded him the title of kaviraja. 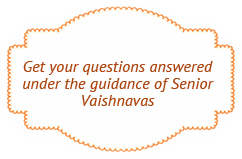 Ramachandra Kaviraj is full of all virtues and Narottam Das’ second self. Kamsari Sen, Rama Sen, Ramachandra Kaviraj, and the three Kavirajs: Govinda, Sriranga and Mukunda are Nityananda Prabhu’s branches. Ramachandra wrote several books, including Smaraṇa-camatkāra, Smaraṇa-darpaṇa, Siddhānta-candrikā, and Srinivas Ācāryera Jivana-carita. Narahari Chakravarti has written an extensive description of Ramachandra and his visit to Vrindavan in the ninth wave of his Bhakti-ratnākara. Everyone would get attracted by his unblemished divinely effulgent form. When Ramachandra visited the Radha-Damodar temple with Jiva Gosvāmī and saw the deities and Rupa Gosvāmī’s Samadhi, he experienced ecstatic transformations that were a source of amazement to all. Gopal Bhatta Gosvāmī, Lokanath Gosvāmī and Bhugarbha Gosvāmī gave him their blessings. He went to bathe in Radha kuṇḍ and Shyama Kund and met Raghunath Das Gosvāmī there. When he paid obeisances to Das Gosvāmī, the venerable saint affectionately embraced him and felt ecstasy. Please be merciful, Srinivas Acharya Prabhu! Narottam Das begs for Ramachandra’s association. I pay my obeisances to Narottam and Ramachandra Prabhus who are always fond of dedication towards devotion to the Supreme Lord, who help people to cross over the ocean of material life, who know all the scriptures completely and have understood all the transcendental doctrines, who are the most generous with the distribution of bhakti-rasa and won the hearts of the atheists, who are constantly attached to each others’ affectionate company. Ramachandra ’s disappearance day is the Kṛṣṇā tṛtīyā in the month of Magh. He disappeared in Vrindavan after the disappearance of Srinivas Acharya.